Padmashri Reema Nanavaty, Director, Economic and Rural Organizing, SEWA Joined the Indian Administrative Services (IAS), and then stepped out for a year to work with SEWA (Self Employed Women’s Association). She stayed on to lead millions of SEWA members, empowering them and lifting them out of poverty. Working selflessly for over 25 years on women’s economic empowerment, green energy and jobs, and children’s rights., she has also expanded SEWA’s work to other parts of India and internationally. She received India’s Padmashri award in 2013. SEWA’s main goals are to organize women workers for full employment and self-reliance. Come and learn how 2 million women have been empowered today and learn their challenges and solutions. 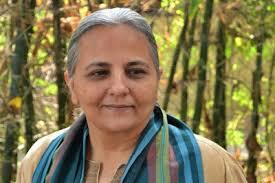 Joining Reemaben to receive the award will be Kapilaben Vankar, President of SEWA.